Wu Wei was a famous figure painter favoured by Ming dynasty emperors (1368-1644). This painting was probably painted in the late 16th to 17th centuries by an anonymous Ming dynasty painter, whose skills were so accomplished that the work is attributed to the old master. Zhong Kui, the Demon Queller, has been a popular subject in figure painting from as early as the Tang dynasty (AD 618-907). The early Zhong Kui portraits were hung at the end of the year to drive away evil spirits. The pine trees, rocks, and river in this painting imply that Zhong is standing in a winter forest, common within early depictions. From around the 15th century, however, Zhong is depicted as a demon queller and bringer of fortune, and imagery in this painting also links him to this new role. For example, a vase held by two demons represents peace, the red coral branch inside wealth, and the fungi at the demon’s waist longevity. The five bats refer to the five blessings: longevity, wealth, health, virtue, and a graceful death. Zhong, holding his jade sceptre, looks up into the sky as if calling to the bats, originally considered as assistants to Zhong because of their ability to search for hidden demons in the dark. New Year Pictures are still hung both to drive away demons and bring good luck, and often feature the Demon Queller. 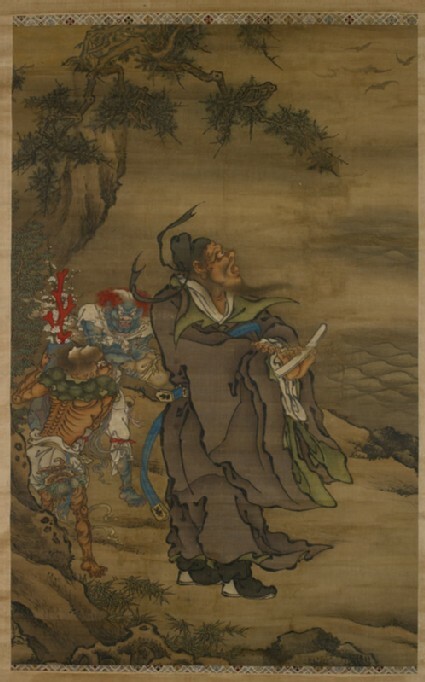 Zhong Kui, or Shōki in Japanese, is a figure from Chinese folklore who appeared to the ailing 8th century Chinese Emperor Xuanzong in a dream and dispatched the demons that were haunting him. Shōki promised the Emperor that he would rid the world of demons.